A spice may be available in several forms: fresh, whole dried, or pre-ground dried. Generally, spices are dried. A whole dried spice has the longest shelf life, so it can be purchased and stored in larger amounts, making it cheaper on a per-serving basis. Some spices are rarely available either fresh or whole, for example turmeric, and must be purchased in ground form. Small seeds, such as fennel and mustard seeds, are used both whole and in powder form. The flavor of a spice is derived in part from compounds that oxidize or evaporate when exposed to air. Grinding a spice greatly increases its surface area and so increases the rates of oxidation and evaporation. Thus, flavor is maximized by storing a spice whole and grinding when needed. The shelf life of a whole spice is roughly two years; of a ground spice roughly six months. The "flavor life" of a ground spice can be much shorter. Ground spices are better stored away from light. 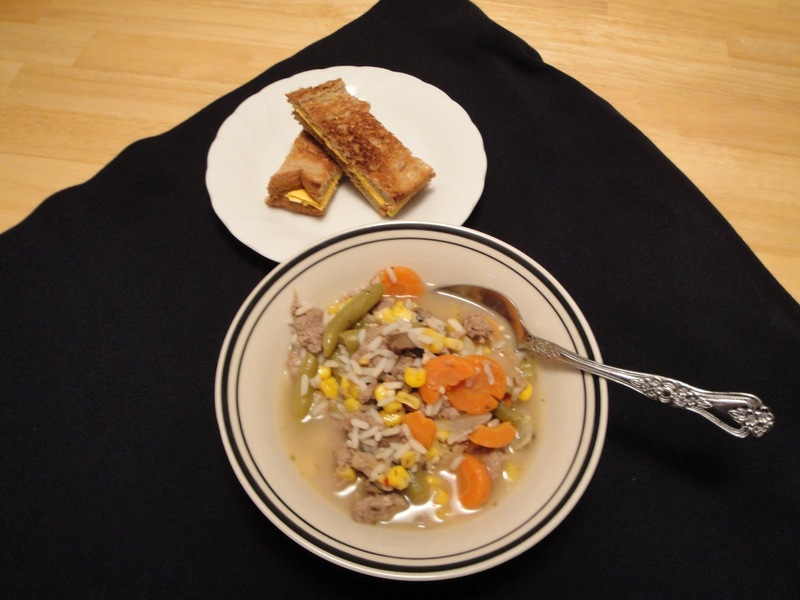 Your family and friends will be satisfy with this easy but tasty turkey rice vegetable soup. This is great for using up roasted turkey breast leftovers. This soup would be great for the day after Thanksgiving. You could also use rotisserie chicken. In dutch oven, heat oil over medium heat. Add ground turkey, salt, pepper and Worcestershire sauce, cook until no longer pink. Add remaining ingredients, stir, bring to boil, reduce heat and simmer for 30 minutes. Taste, adjust seasoning, if desired. Enjoy! It's a great soup any time of the year. Love this kind of soup Turkey is delicious addition! Looks so delicious Christine, my husband and I both love rice in soups! Oooh. For me the real star of the show is that grilled cheese sandwich! This is a great lesson on preserving spices--my husband now labels when we buy all our spices to make sure we're maximizing their use and tossing ones that have lost most of their potency. Now this is something I have never tried, I always make my soups on chicken, beef or pork but never it even occurred to me to try turkey which in fact is cheaper. Thanks for posting, wishing you all the best! looks like a great soup!